With his elitism, scorn for the decadence of modern society and exaltation of the Dionysian principle, Friedrich Nietzsche could be seen as the spiritual forefather of Black Metal. I’m sure many musicians are in one way or another influenced by him and try to embody his ideas. What I also think is that only a handful of bands managed to bring the spirit of his aesthetic philosophy – the idea of spontaneous, joyous, playful creation – to life. Although this may not match the general impression of him, Nietzsche wasn’t an over-serious, pessimistic thinker – a misanthrope or nihilist. Quite the contrary. And many Black Metal band are all too ready to go down that road. One band that seems to me to embody the Nietzsche’s spirit is the Finnish one-man project SATANIC WARMASTER. But as much as I like the Dionysian qualities of its music, Werwolf, the man behind the project, is a hell of a sketchy dude (basically a full-blown neo-Nazi). I’m not on board with the ongoing crusade for the ideological “purity” of Metal, but I do have qualms about supporting people who openly espouse extreme right-wing ideologies, so I have a bit of a love-hate relationship with the band. 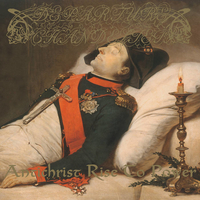 Well luckily for me, there is a new US-Canadian band now with a very eccentric name, DEPARTURE CHANDELIER, that borrows a lot from SATANIC WARMASTER and that is also ideologically clean as a whistle and (its lyrical themes are French history, of all things). What is more: their music is actually very good. The band is composed from members of ASH POOL and AKITSA, that means that the experimental musician Dominick Fernow may possibly be involved (the band stays anonymous, so I couldn’t confirm this). The inspiration from Finnish Black Metal is, I think, undeniable. DEPARTURE CHANDELIER play raw, lo-fi but very melodic music with simple, driving rhythms. The playfulness and catchiness of the music is sometimes borderline Garage Punk. The use of keys is also similar: they are used with measure, usually it’s just one chord or even just one note, but they always add lots of punch to the song. “Life Escaping Through the Candle's Smoke” is upbeat and has a catchy main riff, the vocals parts alternate with a simple, quirky synth melody – the song has almost a militaristic vibe that fits with the war concept of the album. There is a mid-section with a bit more evil, but still catchy riff and eerie, hypnotic keys; this section gets repeated right before the end. “Forever Faithful to the Emperor” shifts between sections with a guitar riff and one with a driving synth melody that is catchy and upbeat – but also strangely eerie – as hell. After a bit slow and grim mid-section there is a section with twin-guitar playing that wouldn’t be out of character on a Garage Rock song, but in the context of this song somehow isn’t tacky. With the title song (track number five on the album) the tone changes – it is a dark, wrathful song. The last song that comes before the minimalist instrumental outro closes the narrative arch of this concept album is titled “Re-Establish the Black Rule of France”. It is a sinister mid-tempo song with some more up-tempo parts, and again, very simple when it comes to melodies and composition, but memorable as well. The album is quite concise – six songs (plus and intro and outro) with a total play-time of 34 minutes. But its compact and the song create a whole that is more than then the sum of its parts. This music is intoxicating, it leads you into a Dionysian abandon. Just let it take over.